In the not so distant past, their mantra was all about "having a conversation" or "opening a dialogue." Now it's "shut the frick up and accept our drivel as reality. Any challenges will be summarily dismissed as racism/sexism/[____]phobia." Congresswomen telling men to shut up during the Kavanaugh brouhaha. Korver saying whites should shut up and listen to whatever. Trump/conservatives being upbraided for taking umbrage with Omar's words own words in clear context. Candace Owens not being allowed to initially respond to blatant calumny, then being falsely accused of calling others stupid during her eventual rebuttal. They want you to shut up....so they can move on to ascribing whatever sordid characteristics they want to your unanswering visage (see: Covington). It ain't about "starting a conversation" anymore. Eh, their "having a conversation" mantra always meant "shut up and listen/agree with me". Wasn't hard to see through. Seems this is only used when they get caught doing shady shite. Yes and it’s very disheartening. So sad. And at the same time, they will say everyone else is being unreasonable. While their tone may have changed, their hypocrisy and projection are alive and well. I had a response to another thread that expounds on my thought about this. Basically the DEMs have thrown all pretense of honor aside and decided they must win at all costs. NOTHING in the current DEMOCRAT party is worth salvaging. The DEMOCRAT party is nothing more than a nascent NAZI party - gas chambers are in the future should they become in total control. Which was a lie even back then. Liberals don't have conversations -- they lecture the non-cultist nonbelievers. Since their 'conversation' bs was just that all along, I would rather that we just see right through it and call it what it is, leftist regressive commie cow manure. What that actor said about her should be replayed by everyone.....pretty sure she'll light him up over it. NOT A CHANCE OF THIS HAPPENING!!! True - it was just a euphemism for their - let me lecture you on how evil you are and you just need to shut up and take it. The professional left are just upping the ante as their status declines. It’s actually good news. Despite all their orange man antics and telling us how Trump is a racist-NAZI-homophonic-instaphobe, Trump’s policies really are middle of the road common sense practical policies. "having a conversation" or "opening a dialogue." This means "let us sell Marxism to you". After the Marxism sales pitch fails, the message becomes STFU. My favorite is how they used to lecture us on how we need to just let the Russia investigation play out. If Trump has nothing to hide then the investigation will confirm it. However, the same approach is not being taken with the FISA investigation. Meant that their point was proved false, but they would immediately turn to well that example was false but we still need to address the overall problem. This is a good point. But now that it’s played out the Democrats do not like the results. No shift at all. 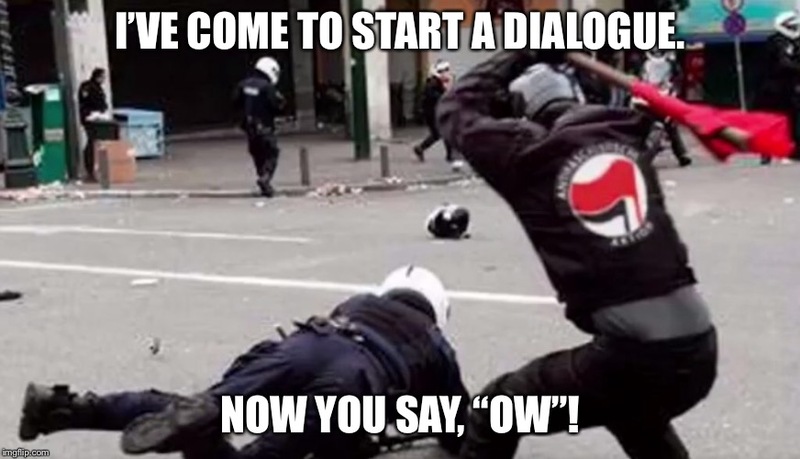 It is only "Starting The Dialog" if it is a liberal. If it isn't, it is hate speech. Been that way for a decade now and it is only getting worse. Kathy Griffin can pose with a beheaded Trump and that is free speech. Trump calls out a clown making light of 9/11 and somehow he has instigated death threats, not the clown's own actions making light of 9/11, making antisemitic statements, or defending terrorists. I only opened this thread and read it because you're a black conservative novelty and I enjoy your shtick. I thought “starting a conversation” was only used when whatever outrage of the week they were trying to back got ultimately debunked.